Electric Groove Fish is one of Orbulon's microgames found in the IQ folder in WarioWare, Inc.: Mega Microgame$! It returns in WarioWare Gold, this time hosted by Mona. 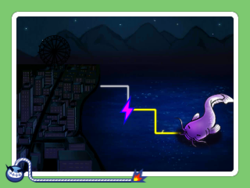 The objective of the game is to travel with the electricity along the line from an electric fish to light up the city. The player must always start by pressing left. Subsequently, every time the electricity hits a corner, he or she must press the direction the line turns. 1st level difficulty: The path is uncomplicated and requires either three, five or seven presses to complete. 2nd level difficulty: The path has more turns in it and requires seven presses to complete. 3rd level difficulty: The path is very complex, with many sections moving over each other, and requires either eleven, fifteen or seventeen presses to complete. 1st level difficulty: The path requires five presses to complete. 2nd level difficulty: The path requires eleven presses to complete. 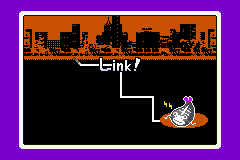 3rd level difficulty: The path requires fifteen presses to complete. This page was last edited on January 3, 2019, at 12:33.